Hunter Thompson Shirts Like You've Never Seen Before! 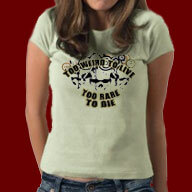 We are huge fansd of Hunter S. Thompson and our line of beautiful tribute Hunter Thompson shirts reflect that. We set out to design the worlds most beautiful and reflective tribute shirts dedicated to the father of Gonzo Journalism you can find anywhere and we feel we have done that. Whether you are just a beginning reader of his work or just enjoyed "Fear and Loathing in Las Vegas" for the tenth time, we feel you will find some design here that will allow you to relive the wild and vicarious ride our favorite author takes you on in his books. 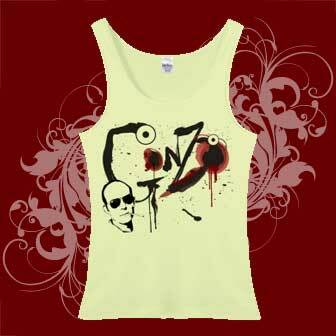 Gonzo art t-shirt featuring Hunter S Thompson and an artists rendering of Gonzo in all it's uncontrollable appeal. Crazy, violent and in-your-face, this Hunter Thompson art piece is one not to be missed. 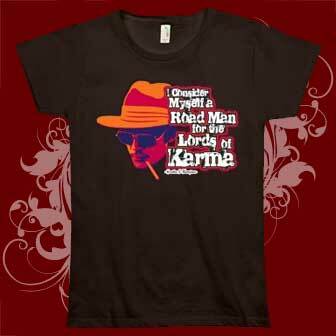 It's a beautiful t-shirt that Hunter Thompson fans love. This is a hilarious and wild Hunter Thompson shirt with deep reds and wickedly appealing lettering with crazy swirls and a manic Thompson illustration finishes it off beautifully. 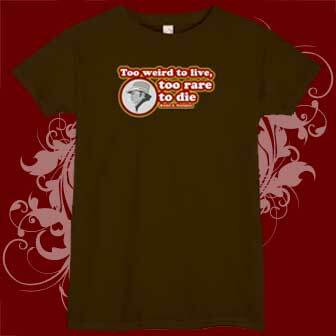 If you are a Hunter S. Thompson fan we know you will want this. 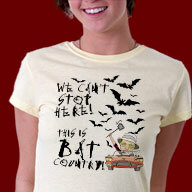 One of our most popular HST designs of all time. Our very artful Hunter S Thompson Profile design captures the spirit of the great author's character and is a favorite of any Hunter Thompson fan. Inspired by Fear and Loathing in Las Vegas, The decision to flee came suddenly! 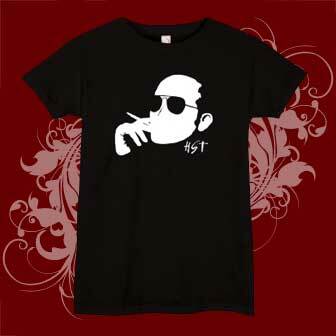 A hilarious Hunter S Thompson shirt perfect for any fan. 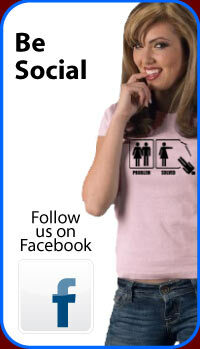 These t-shirts, sweatshirts and hoodies have a lot of character and are available in many styles and colors. Beautiful Hunter Thompson shirt design featuring grungy lettering and a really cool illustration of Hunter Thompson himself. 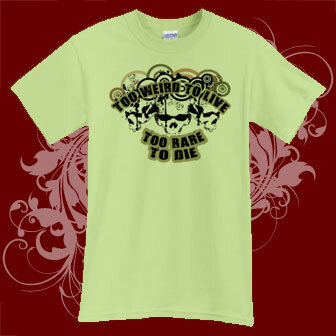 This is a must have shirt for any Hunter S Thompson fan! A terrific quote inspired by the film "Fear and Loathing in Las Vegas. 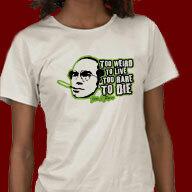 Great shirt design for Hunter S Thompson fans. Our Hunter Thompson t-shirt is really gorgeous with all kinds of grungy swirls and splats dancing around the opening monologue of the movie "Fear and Loathing in Las Vegas" It's a new design that hits home with the frantic but meaningful feel of the movie. Beautifully designed Hunter S. Thompson tribute design with great color and feel. 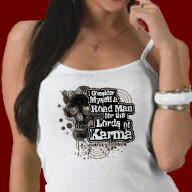 "I consider myself a road man for the lords of karma." A wry and hilarious quote from Thompson himself. 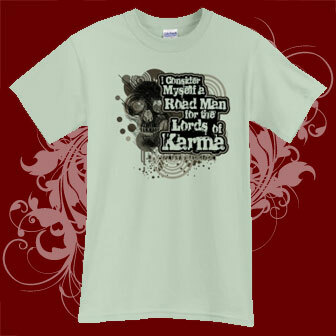 This is a beautiful design that prints nicely on any color or shirt design you choose. Hunter S. Thompson shirt. 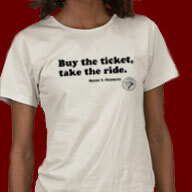 Very cool design featuring one of his most beloved quotes...Buy the ticket, take the ride. 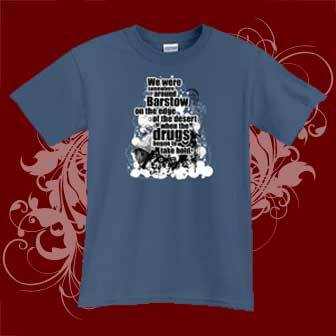 A very cool shirt for fans of the father of Gonzo Journalism. 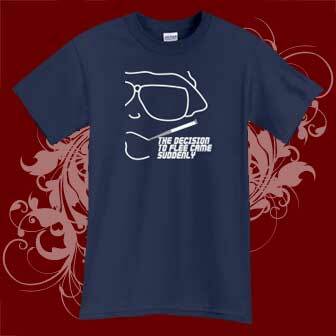 Awesome Hunter S Thompson t-shirt featuring one of his most famous quotes. 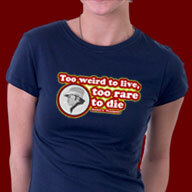 Too weird to live, too rare to die. Very cool colors and an artist's profile sketch of HST himself tops this one off to great appeal. 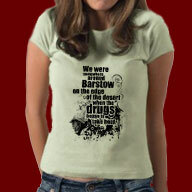 Fear and Loathing in Las Vegas t-shirts. 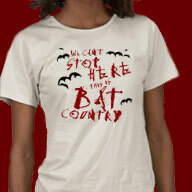 We cant stop here this is bat country t-shirts, hoodies and more. The off the wall design is styled from the original title art in the motion picture. 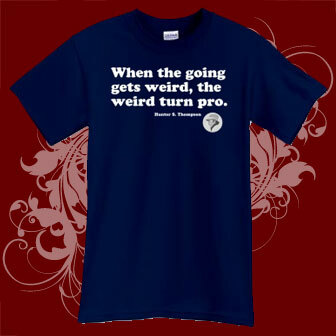 A must have t-shirt for Hunter S Thompson fans too. 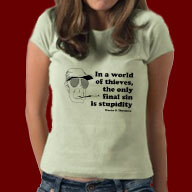 Very cool quote from Hunter S Thompson featured on this shirt with a quirky sketch of the author. 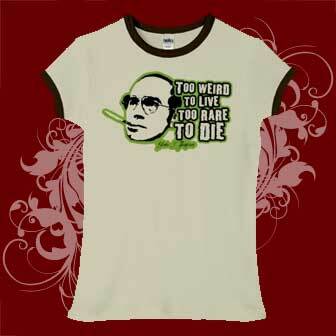 Must have for HST fans! 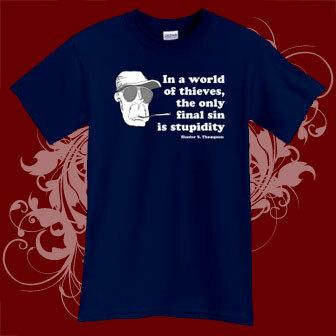 In a world of thieves the only final sin is stupidity. 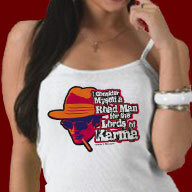 Hunter Thompson quote, "I consider myself a road man for the lords of karma." Hilarious quote from the father of Gonzo Journalism. 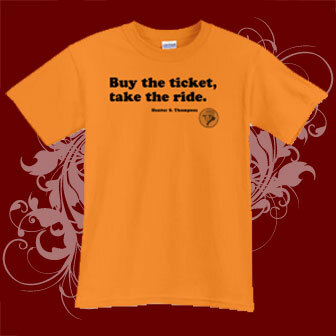 Hunter S Thompson shirts featuring one of his most beloved quotes from the book, "Fear and Loathing in Las Vegas" Buy the Ticket Take the Ride! Wonderful shirt features a nice drawing of Hunter below. 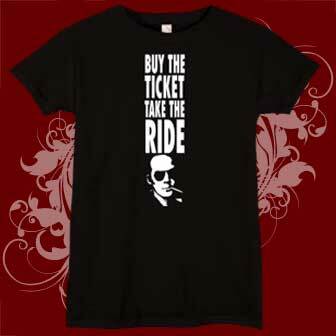 Awesome Hunter S Thompson t-shirt featuring one of his most famous quotes. Too weird to live, too rare to die. 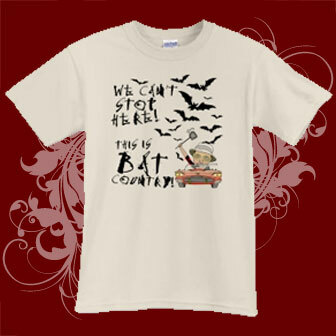 Very cool colors and grungy style makes this a beautiful shirt for Hunter fans. From the hilariously strange classic movie featuring Johnny Depp as Raul Duke, AKA Hunter S Thompson, Fear and Loathing in Las Vegas. 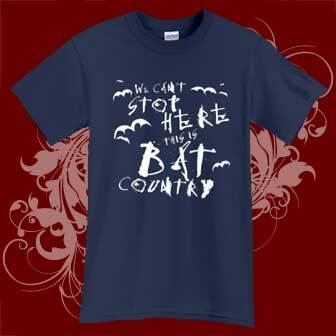 We can't stop here, this is BAT COUNTRY! 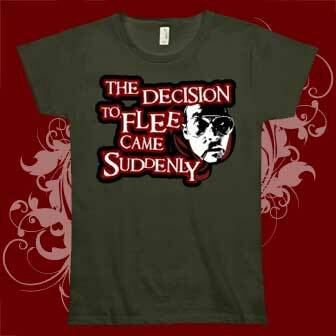 Funny shirts for fans of the movie or the man.